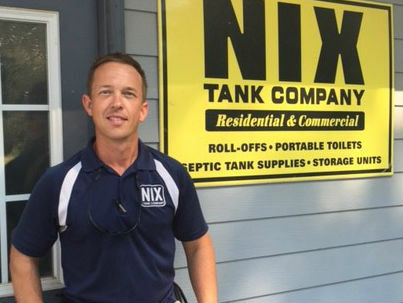 Nix Tank Company is a portable restroom supplier and waste disposal service provider, serving the Atlanta Metro area and North Georgia for over 40 years! We specialize in dumpster rentals, portable toilet rentals, septic tanks and storage containers for construction projects, special events and more. Our promise is to provide quality products with unparalleled customer service! Grease traps, storm shelters, plastic/PVC products, drainage systems and manhole/vault covers. We supply dumpsters for residential, commercial and industrial use in 22 North Georgia counties. All steel, water tight, lockable exterior construction storage boxes with a wood floor on the inside. Restrooms with holding tanks, hand sanitizers, freshwater sinks and more. Construction toilets also available. Hosting an upcoming event? 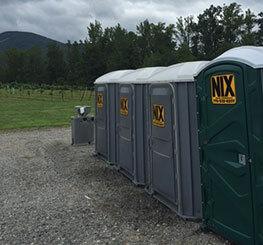 Protect your facilities by supplying your guests with portable restrooms.